Below are the complete details of the Registrar jobs in Medical Teaching Institute in Mardan. Skills Required for Job: Candidates must have Good Communication Skills. Good Team Working Skills. the ability to relate to people from all backgrounds and cultures. tact, patience and empathy, for dealing with people who may be distressed. the ability to understand and apply rules and laws. clear and accurate handwriting. the ability to work under pressure. 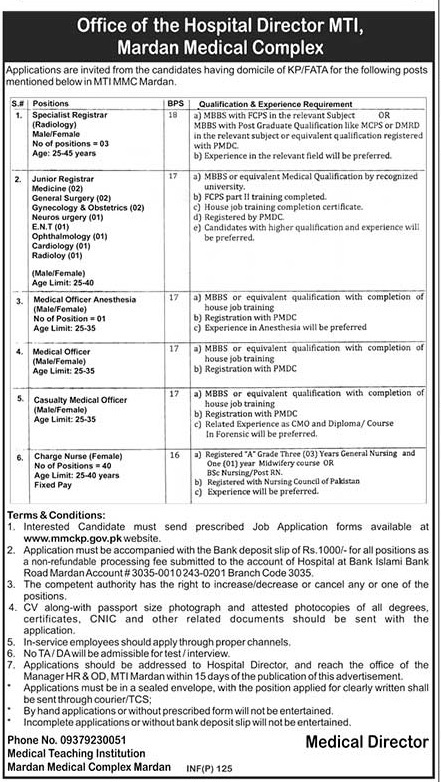 Qualification: Medical Teaching Institution Mardan Jobs For Registrar. Required Qualification: MBBS from Recognized University/ Institution. Age Limit: Minimum 25 Years or Maximum 45 Years. Attractive Salary Package. Last Date for Submission of Application With in 15 Days. 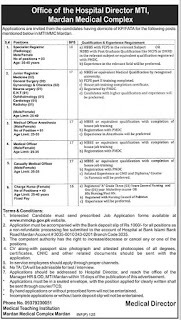 Registrar jobs in Medical Teaching Institute Mardan, in Pakistan published on Paperpk.com from newspaper on January 08,2019. Job seekers who are already working as Registrar , Senior Registrar , Assistant Registrar , Deputy Registrar , Assistant Registrar , Additional Registrar , Junior Registrar can also apply for post of Registrar.